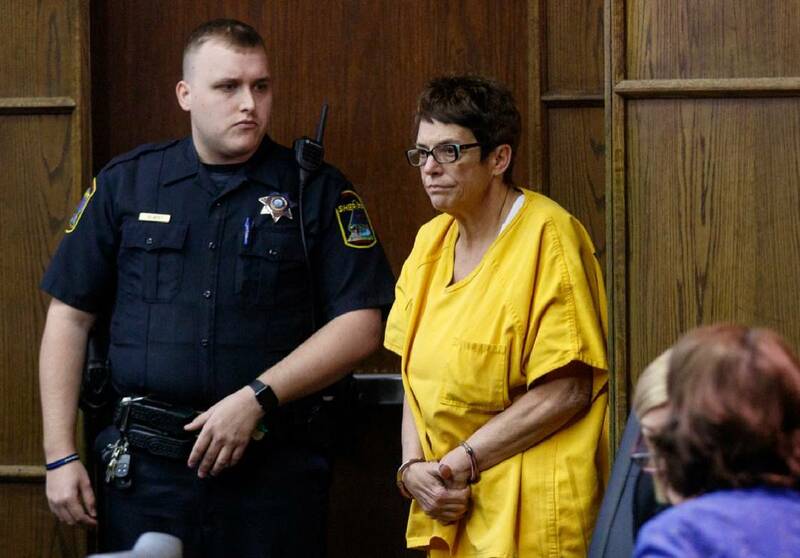 Janet Hinds is led into a courtroom for a preliminary hearing before Judge Alex McVeagh at the Hamilton County-Chattanooga Courts Building on Tuesday, March 5, 2019, in Chattanooga, Tenn. Judge McVeagh bound charges against Hinds in the Feb. 23 hit-and-run death of Chattanooga Police Officer Nicholas Galinger over to a grand jury. Updated at 10:37 p.m. on Tuesday, March 19, 2019, with more information. Family members of Chattanooga police officer Nicholas Galinger have sued the woman charged with hitting and killing him. Barry and Gretchen Galinger are asking for $10 million in civil damages, accusing 55-year-old Janet Hinds of negligence and recklessness, in a wrongful death lawsuit filed Tuesday in Hamilton County Circuit Court. Though separate, the lawsuit is related to the criminal case against Hinds, who faces nine charges of vehicular homicide, leaving the scene of an accident with death, reckless driving, driving left of center line, failure to render aid, violation of traffic control, failure to report an accident and driver's responsibility to exercise due care. Chattanooga prosecutors say Hinds was speeding and under the influence of alcohol when she struck Nicholas Galinger as he inspected a warning sign above an exposed, overflowing manhole cover on Hamill Road in Hixson on Feb 23. Though prosecutors have not charged Hinds with impairment-related counts yet, they recently announced they will seek them. The Galinger family lawsuit, filed by Nashville attorney Ben Rose, recounts most of the state's facts from that Saturday evening: Hinds had four beers and a shot of liquor at a restaurant in Ringgold, Georgia, before getting behind the wheel around 10:33 p.m. and driving back to her home in Hixson. On the way, she struck Galinger and continued driving. She ultimately turned herself in the following Monday morning, the suit says. "Although Ms. Hinds was aware, or should have been aware, of the fact that she had just struck Officer Galinger Ms. Hinds fled the scene," Rose wrote in the suit. Rose said Galinger's surviving family members, including his two minor children, are entitled to damages because of Hinds' gross negligence and recklessness, which caused Galinger to experience "severe and excruciating injuries" and which led to his untimely death. Since the lawsuit comes amid a criminal proceeding, a few different things can happen: A judge could "stay" the proceedings until the criminal case is finished or allow it to proceed with a few restrictions on evidence. In a civil proceeding, Hinds could be deposed under oath and asked questions about the fatal incident. If that happened, she could assert her Fifth Amendment right to remain silent. Before any of that happens, a judge likely will hold a hearing to determine if the risk of Hinds potentially incriminating herself outweighs the suit moving forward. Hinds' attorney, Ben McGowan, could not reached for comment Tuesday. So far, McGowan has argued that several other factors made the incident an unavoidable and tragic accident. McGowan said the warning sign and Galinger were not visible to Hinds: The officer was not wearing an illuminated safety vest and possibly bending over when he was struck. So, McGowan recently argued, "it's just as possible she thought she hit a sign and kept going the five to 10 minutes home on a dark, rainy night." McGowan added he plans to have Hinds' vehicle data evaluated and see if it matches the state's speed estimate that she was traveling 47-52 mph in a 35 mph zone. Hinds remains out on bond. She cannot drive, her passport is revoked and she is outfitted with a GPS and alcohol monitoring bracelet. Prosecutors will present her case to a grand jury in the near future.